I'm the queen of procrastination. If you recall my midterm project was finished at approximately 3:30am due to my procrastination issue. This time around I'm trying hard to get most of my final done before that 3:30am mark. I'm getting the sources pulled together right now, I'll update this post later with all the lovely sources. I'm doing a fun, preppy giveaway tomorrow and make sure to come by and enter girl! Wow. I LOVE the bright colorscheme and the variety of patterns and textures in this space. love, love this moodboard, so cheery! what program do you use to put these together, out of curiosity!? I did the same thing!! I think I was up till 4:00am. Good luck!! You procrastinate real good! ha! Such a pretty room. You sound like me. But it gets done, right, that's all that matters. Not when it gets done. Plus, look at the creativity that flows as a result - so worth it! I'm in love with that curtain fabric! Been lusting after it for a while! I'll be checking back in for sources!! Great board!! Love all the color! Good luck! Loving that family room board! I'm a horrible procrastinator too- I need to be under fire to get anything done! I've been looking for a rug like that. Do you have a source? Well its a lovely board! Good luck on getting focused! Gorgeous! Hope you share that colorful wallpaper (or is that fabric?) source! Great space. 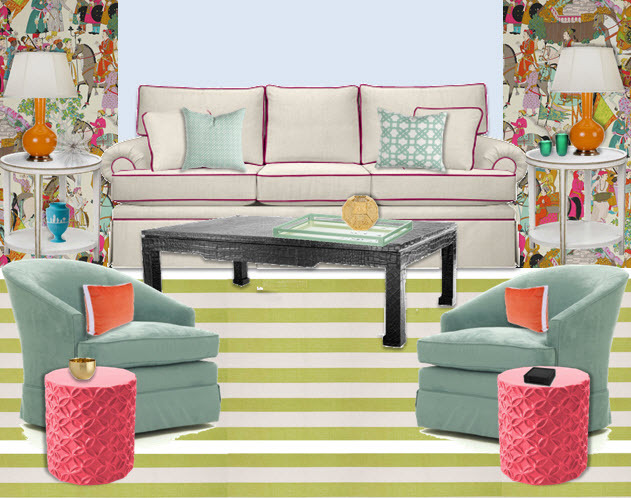 I love your combination of bright fabrics and patterns, it would be such a fun space. Good luck on your final!